The unabridged English translation of Dmitry Merezhkovsky’s most popular novel “Leonardo da Vinci: The Resurrection of the Gods” will be out this year, to commemorate the author’s Sesquicentennial. Why did the popularity of this nine-time Nobel nominee fade, while younger writers from the early 20th century’s Silver Age are still feted? As Russia marks 150 years of Symbolist author Dmitry Merezhkovsky’s birth, Alma Classics is publishing the first complete English translation of Leonardo da Vinci: The Resurrection of the Gods, the story based on the life of the famous Italian Renaissance artist. Ignat Avsey, who died in 2013, specialised in unearthing forgotten literary gems and translating them into English. Among these were several novels by Fyodor Dostoevsky. Avsey regarded this posthumously published translation of Merezhkovsky’s work on Leonardo as his most important translation, which could be the spark that reignites the reputation of the author nominated nine times for the Nobel Prize for Literature. Through the nearly 700 pages, Merezhkovsky travelled in the artist’s footsteps, while sketching vivid landscapes with his words. First published in 1900, the novel was the second part of a Christ and Antichrist trilogy dealing, as much of Merezhkovsky’s work does, with the nature of religion. Like Bulgakov’s The Master and Margarita, Leonardo is full of devils, bacchants and naked, flying witches. Merezhkovsky, one of 10 children, was born on Aug. 2, 1865. His father served as a privy councilor under Alexander II. His childhood homes, a palatial dacha on St. Petersburg’s Yelagin Island and a classical-style Crimean estate between mountains and sea, gave Merezhkovsky’s imagination some picturesque source material. Hearing bible stories and saints’ lives from the housekeeper, he developed a lifelong religious devotion. 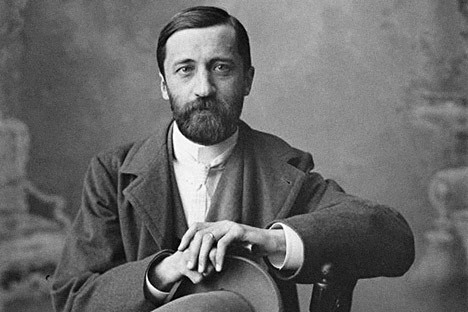 Merezhkovsky’s poetry was first published while he was very young, despite the scorn of Fyodor Dostoevsky, who told him he would have to suffer to write well. In 1892 he published a second book of poems, Symbols, and his lecture On the causes of decline in contemporary Russian Literature, which glorifies individual creativity, and is now seen as an early manifesto for the new literary age. Sergei Diaghilev and the World of Art magazine welcomed him and published his literary essays. Merezhovsky and his flame-haired wife Zinaida Gippius, who was also a poet, became increasingly interested in esoteric religion, attempting to create their own church. After the 1905 revolution Merezhkovsky prophesied: “The church will be torn down and the monarchy too,” and argued that a spiritual revolution was needed before a physical one. He was accused of having terrorist connections, and his gloomy prognostications about Bolshevik tyranny soon came true. He described the new government as “the Antichrist's Kingdom Come.” The couple sold all their belongings and fled in December 1919, never coming back. In 1925 Merezhkovsky launched The New Ship magazine in France as a focus for dissident, émigré literature. He became friends with another exiled writer, Ivan Bunin, who won the Nobel Prize in Literature in 1933. Merezhkovsky continued to write prolifically and is said to have died with a pen in his hand.